• Suitable for: BJC-8200 Photo/i865/i905D/i9100/i950/i965/i990/i9950/PIXMA iP4000/iP4000R/iP5000/iP6000D/iP8500/MP750/MP760/MP780/S800/S820/S820D/S830D/S900/S9000. • Page Life: 280 pages. Make sure your printer performs as it was meant to by purchasing a genuine Canon Black Ink Tank that will not only produce excellent results but also help to extend the overall lifetime of your printer. 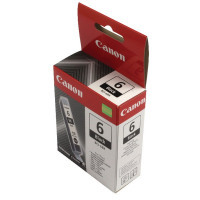 Easy to install and replace, the BCI-6BK cartridge produces outstanding quality, precise and sharp black text and images and each cartridge will yield up to 380 pages. Compatible with Canon PIXMA and Bubble Jet printers, it should be your first choice for printer consumables.